The featured speaker at the awards dinner at our local chapter of the National Alliance on Mental Illness was listed in the program under the name: EARLEY. But it was not me. It was my son, the person whom many of you have come to know from my book: Crazy: A Father’s Search Through America’s Mental Health Madness, by the name MIKE. The NAMI meeting was the first time that he has ever spoken in public and he got a much deserved standing ovation after he’d described his journey to recovery. I am tremendously proud of him. Like so many others, our family has been through a roller coaster of events and emotions since 2001 when my son was first diagnosed with a severe mental illness. He’s been arrested and shot with a taser. There have been court hearings, four major breakdowns, repeated hospital stays, hours of therapy, angry words — so many angry words — even feelings of hopelessness and despair. But for the past three years, he has been doing fantastic! He has been able to manage the symptoms of his illness. He is in RECOVERY and he is one of my heroes! There are many reasons for his recovery, but he deserves the most credit. He has worked hard to get better. Fortunately, he had the expert guidance of a tremendous case manager. My son found a medication that helped him. And he had access to other crucial services that he needed! I am blessed. I am telling you this to give you HOPE for your loved one. People do get better! But why am I telling his story, when his own words can tell it better than me? Here are excerpts from his speech. When you read them, you will understand why I am proud and fortunate to have such a wonderful son. I know many of you are struggling. Don’t give up. There were times when I didn’t think we would get where we are today. I am one of the many faces of mental illness. Although I am proud to say I am one of the many faces of mental illness, it is not the only role I play. I am a poet, a painter, a musician, a writer, a friend, a brother and a son. Even though I am not solely defined by my mental illness, it is one of the roles I play and I am here today to tell my story and my journey of recovery through living with a serious mental illness. The faces of mental illness are as varied as the faces of any other type of people living and coping with disabilities. We have a variety of professions, ethnic backgrounds, cultural beliefs and religious denominations. We come in all forms and shapes and sizes. All colors of the spectrum, and all points of the socio-economical wavelength, we come in all manners and fashions. Various people ranging from politicians to celebrities to famous sports figures have dealt with mental illness in their lives. It can happen to anyone. Most people who are not involved directly with the mentally ill, whether through a loved one or a family member, tend to think of us in the worse manner possible…People are reminded of the worst of consumer actions, like the tragic Virginia Tech shooting or the most recent shooting in Tucson. As much emotion as there is in an event such as a violent shooting, collectively as a society, we are often looking for a group to punish, to stigmatize and to blame and our emotions sometimes get the best of us. While there are thousands of cases of non-violent, peaceful consumers, living productive lives in society — that is not always the reality that is shown through our media or perpetuated by stereotypes or ignorant gossip. I am speaking out because I think it is necessary for those of us who live with mental illness, those of us who are peaceful and find ways to contribute to society in spite of our disabilities, to be heard. It is important we have a voice so that we can counteract the images and ideas that may run counter to our cause of ending stigma and raising awareness of mental illness. We are your neighbors, your co-workers, your family, your lovers and your friends. We are not all dangerous lunatics or lonely gunmen. We deserve to be treated with the same respect and dignity as any other group of people living with disadvantages. We are similar to patients living with leukemia or cancer, in that we are dealing with an illness that we did not ask for, and we are fighting for our lives daily. 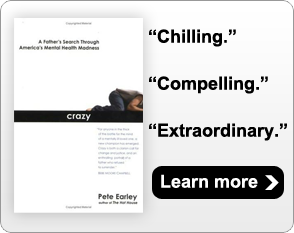 You maybe familiar with my story if you have read the book “Crazy- A Father’s Search through America’s Mental Health Madness”by my father, Pete Earley. ..Years ago, when he first was considering writing about this issue and our shared journey, he asked me if I would be interested in telling my story. My reply was, “If it helps other people, I am willing to do it”. Well, I stand here tonight to tell you that it has helped other people, including myself, learn about mental illness and the journey of recovery. Back then, I did not know I would be taking the first steps on a path to becoming an advocate for mental health. I was heavily in denial, and like many of you in the audience who may have a family member or a loved one living with mental illness, or may even be living with mental illness yourself, it was hard for people to reach me. My journey, as good as it feels to stand here today and speak, has not been without sacrifice, hard work and even a bit of embarrassment. My father tells me, everywhere he travels, from California to Europe, he gives his speech, and without fail, asked the same question verbatim. I am here to tell you that “Kevin” is doing great! In the book, I am referred to by my middle name, “Mike”. My father chose to use my middle name to identify me in the book, partly because he was fearful of the stigma associated with my condition in this age of lightning fast internet searches, where anyone with a computer can do a background check. He was afraid I would have a hard time gaining employment with my mental condition. But he also used my middle name because it was easier for him emotionally to write the book using my middle name, to give him some distance from the trauma of what we had been through together. It was as if “Mike” was the part of me that represented me at the lowest points of my illness, and my first name “Kevin” represented all of my potential that was dormant at the time. Back then, it may have made it easier for him to write about our experiences using my middle name, but I stand before you today as Kevin, the name I was given at birth. This is the name I go by without fear because part of erasing stigma is to claim ownership of our condition, and to stand up to any fears that we may have, even those within ourselves and our own relation to a fearful society. We cannot conquer fear by being fearful. If others wish to be fearful, our solution is to take a higher path and show them that we are not afraid. When I talk about having a mental illness, I am not scared or cowardly or embarrassed. I look people in the eyes and admit that I am living with this condition, so that when they see me, they no longer see the actions of a Virginia Tech shooter or a Tucson shooter. They see a person who is just like them, and they often express shock and surprise, amazed that I am one of the many faces of mental illness. They are amazed because I try my best to conduct myself in a way that is gracious, humble, thankful, caring and respectful. After meeting with a person who exhibits such qualities, how could you ever go back to being fearful or prejudiced? …It is challenging work, especially when I deal with consumers who are as hard to reach today as I was during low points in my past, but I cannot explain how rewarding it is when I do reach someone, when I do make a difference and impact the course of another person’s life… I feel that I have finally found my professional calling, and every day I am joyous that I am able to serve others in such a capacity. When one is first diagnosed as having a mental illness, it can be very hard to wrap one’s head around. I think to me, the initial reaction was one of disbelief and denial. I was a young, brash and arrogant 22 year-old. I was the typical young man, who thought of himself invincible with an inflated ego. I had no idea how much my ego would eventually be deflated…. … In the following years, I would conduct myself in a repeated pattern. I would stabilize due to my medication. I would declare myself “okay” and stop taking medication and I would relapse, have a psychotic episode with the police involved and end up back in the hospital. It went on like this until December, 2007. I had been off my medication for about 6 months, which is the usual amount of time I could keep it together before my sanity collapsed, and again, I fell into a fit of crying uncontrollably. No matter what I thought of or tried to do, I couldn’t stop myself from crying. This went on for about an hour. I called my case worker and my parents and I agreed, for the first time, to go to the hospital on my own accord. In the past, I had been taken to the hospital by force. This time, I went on my own accord. This time was different. I had hit rock bottom. I finally woke up from the force of denial and admitted to myself that I had a mental illness. I couldn’t argue with the evidence anymore. A doctor who was seeing me at the time explained to me that every time I went off of my medication I was doing physical damage to my brain, as it would take a higher dosage of medication to regain stability. I don’t know what it was that changed my mind. I don’t know why, on that particular day, after more than 6 years of following the same repeated pattern of going in and out of treatment, I don’t know why those words finally sunk in and registered in my being. But they did, and I began my slow ascent from the darkness of my own mental illness. I began to take charge and control of the beast that is mental illness and I began my recovery. People wonder why someone with a mental illness would go without medication. They think of it as such an elementary step and such a necessary one, they have a hard time understanding why someone who was in the position I was in would go without taking meds. I tell you, it is not as easy as it seems. In the past denial was a strong factor. Even when evidence of my own madness would be presented, my mind would find a way to weave out of the circumstance and an obtuse reasoning would somehow form that would keep my own pride intact. Always two steps ahead of the truth, my brain would tap-dance its way into a room where I was not at fault, where it was everybody else versus me, where I was some sort of prophet or special medium who was undergoing visions, not hallucinations, and I was important, not a victim. It is very hard to understand about the denial until it happens to you. To think that one’s own credibility is broken, there is a lot of personal shame one undergoes when they realize that they are no longer in line with society’s understanding of sane. It makes one doubt one’s own instincts and second guess the movements and decisions that one makes. Suddenly, the veil of confidence and ability has been lifted and one is a wreck, struggling to piece together the remnants of what are left of one’s self-image. Another factor at the time was my desire to recover without use of medicine. I wished for a more “holistic” cure. I did not trust the big pharmaceutical companies, I wanted my cure to be natural and of the earth, not man-made and formed in a laboratory. I felt paranoid. At the time I was invested in various conspiracy theories, and it was the government or “big brother” who wanted me to take medicine. I looked at taking medicine as me surrendering my freedom and a form of acceptance of my mental illness, which at the time I was in denial about. I did not believe that a pill could simply cure me. When I finally did start taking medicine it came down to two things. The first thing was the track record I had when I used medicine versus the track record I had when I did not use medicine. When I was on medicine, I did well. When I was off, I ended up in trouble. I could not argue with the evidence. It was as simple as that. The second thing that made me take my medicine was a vow I made. My brother came to me in 2008. He was about to have his first child, making me a first time uncle. He told me that if I wanted to be a part of his child’s life, I would have to take my medicine. I made a promise to him, for the sake of my niece, that I would do such a thing. Nowadays, I take my medicine religiously. I know I am fortunate. I have had the support of good friends, and a family who has taught me the meaning of unconditional love. I can see now, in my own field of work, people who may have a chance to regain and reclaim their own lives from mental illness, but face a more difficult struggle because they do not have the support systems I had. I see how easy it can be to fall through the cracks when one doesn’t have the access to housing that my mother gave, and must meander through the system of shelters and streets. I see how easy it is to get caught up in the legal system when one doesn’t have the advocacy my father had for me, to help me with lawyers and trials when I wasn’t exactly competent to understand, I’ve seen others go in and out of jail in a vicious cycle. I am lucky to have good friends. Sure, there were people who turned their backs on me and people who ended their relationships with me because of my mental illness, but they weren’t real friends anyway. The ones who stood by me for years, the ones who cared about my illness, learned about it with me and checked in on me and visited me in the hospital, those are the ones I am proud to consider my friends. I have seen how loneliness can be a burden and how little things like just having someone tell you that they care about you can change your course and attitude. The work I do now is my way of paying forward for the work people have done in my behalf. I figure the best way I can pay back for all that has been given to me is to be successful. The best I can do is be successful and share my success story with others, in hopes that they one day will be successful as well. I leave you today by saying that I am a success and to prove to you that recovery is in fact possible. If you are sitting here and wondering how you will make it through the day, how you will ever regain your life from mental illness or regain the loved one who has mental illness, I am living proof to inspire you not to abandon your hope. It is not easy, there is no simple “quick fix” to mental illness, but I am a testament to the power of redemption and recovery. I have been where you might be today, and I did not know at the time how it would ever be possible to emerge victorious from my battle with mental illness, I did not know even how I would make it day to day, but I have, somehow, some way made it through the storm. If you find yourself in times of despair when it seems that recovery is an impossible feat, use my story as inspiration and realize that, just as I am only one of the many faces of mental illness, I am also only one of the faces of those who have recovered from mental illness. I am not the sole success story of mental illness. There are many people who have faced mental illness and won, people who have gone on to live successful lives and to have rewarding careers in all fields. There are people of every walk of life who have faced similar demons and won the hard fought battle. Think of us when your back is up against a wall. You are not alone. Recovery is possible. Thank you. Does your son give speeches to other groups? I salute him for speaking out and telling his story so well. I’d love to get him to speak to our group. Kevin, it is so nice to know you are an “empowered and engaged” patient who has found a voice in advocacy. Your story would fit in nicely with the Journal of Participatory Medicine which supports the Participatory Medicine Movement. Mental health advocates need to ask, is recovery from severe mental illness possible without participatory techniques? The coincidences in my life with Pete’s are funny. Besides sharing a last name, my husband’s name is Kevin. My daughter has a serious mental illness. Her first psychotic episode was in 2004. Her lack of insight has been profound though. She never would have given me permission to speak about her in a book. She did give me permission to do an interview I did for CBS at the beginning of this year but she wouldn’t be involved in the interview. I think she may start speaking for herself soon as well. Our family doesn’t distance ourselves from Jared Loughner though. My daughter cries for him when she hears the nasty comments people make. After all, there but for the grace of God……………. Maria, while I respect what you stand for, I would have to say that my daughter has only been able to begin the recovery process due to the fact that she has received treatment without much, if any, participation on her part. She hasn’t wanted any part of medication. She has been court ordered to receive treatment for the better part of the last 7 years and has had to receive injections for the last 2 1/2 years. At the end of last year they allowed her to participate in her own care yet again. She agreed to take the oral medication of her choice & they let her get off the shot. Of course she didn’t take the oral medication, and unlike Kevin who can stay well for 6 months, within 3 months she’s psychotic. She still has good days & bad days but many more good days now than bad days. She says that court ordered treatment has saved her life. She’s thankful that nobody has listened to her. She’s glad that when she was yelling “leave me alone, I don’t want the meds”, we understood that she was asking for help & she needed the meds. She’s glad she receives help even when she’s unable to understand she needs it. Lois, as well, I respect your position as a concerned parent doing all they can for their child. I understand how difficult it is to have a loved one suffering from symptoms of severe mental illness. I have been in your shoes myself. I think it is of critical importance to acknowledge and be aware of the fact psychiatric medications have many potential harmful side effects. This fact can not be ignored and an individual should not be forced into taking a medication that can have long-lasting, or fatal consequences without the option of safer alternatives. For example, in his book Crazy Pete Earley discusses the case of Diedra Sanbourne. As tragic as her life may seem, the fact is she died while being treated in a psychiatric hospital of a bowel obstruction. When I read this in Pete’s book over three years ago, the first thing I did was to do a search through medline to see if there are psych meds that cause bowel obstructions. In less than one minute the search indicated Clozapine, used to treat schizophrenia, can cause fatal bowel obstructions. If Diedra did die from the medication Clozapine, this fact should not be ignored and her family has the right to know the truth. It is the patient, not the care-giver who experiences the negative side effects and they have the right to be informed, engaged and empowered in their treatment approach. It is also important to understand that going off of psych meds is not easy and withdrawal symptoms can induce psychosis. Yes, it is very complicated. What makes the most sense in cases of acute psychosis is to consider the many underlying medical conditions and substances that can induce psychotic disturbances, test for them and treat them. Currently the only organized mental health advocacy group that considers etiological factors of psychiatric conditions is CCHR, which unfortunately gets a bad rap because they were founded by the Church of Scientology. Yesterday I met with the Executive Director of CCHR in Clearwater, FL. who I have met with in the past. I am not a Scientologist and CCHR does not try to convert people, they are trying to educate people. CCHR has a hotline for individuals dealing with a crisis situation. In just one month they received 3 calls from parents whose children experienced an acute psychotic episode. After discussing in length their child’s case the connection to the psychotic episode was linked to the use of over-the-counter cold medicine in all three cases. These are three cases of kids who could have ended up labeled with paranoid-schizophrenia for the rest of their life had it not been for the efforts of CCHR. This is so very hard to read, but so very powerful. This conveys all the hope I had for my own beloved son, who died by suicide 2 1/2 yrs. ago. My son had a loving and supportive family who never gave up hope, but alas, we were not able to get him the community services he needed when out of the hospital. I am convinced that had he had a good ACT (Assertive Community Treatment) team, including peer support, he had a good chance for recovery. I don’t say this to have others give up hope. Your son’s story is filled with hope, with what can happen with the right support, and with the courage your son so clearly has. You have good reason to be so proud of him, and so grateful. I thank both of you for the work you tirelessly perform so well, to help others understand the devastation of mental illness, but the hope in treatment, if we can all just make sure people get it. Kevin, I’m so honored and proud to read your speech! Your dad is one of the reasons my son Tim and I speak about his diagnosis, also in 2001, ironically, but at the age of eight. You are an amazing example of what the right supports and services mean to no only you and your friends and family, but to society as a whole. Kudos! As we say in ‘da hood: mazeltov! And thank your son for speaking out. I have always thought that the reason people don’t understand MI is that people with it don’t acknowledge it, and their families hide it. No wonder it’s misunderstood and eyed with suspicion. Speeches like this really do help. Thank you for giving it. It makes all the difference in the world to believe that something better will happen when we talk about mental illness. I am happy to hear that both you and your son are doing well, and have found a solution that both of you can work out together. Being creative, expressive can open many parts of you. As it can be great therapy too. Good healthy body and healthy mind, means longer healthier lives. Accentuating the positive things in life. Certainly everyone in the Earley family has a lot to be proud of and thankful for and it is always wonderful to hear of a positive outcome such as Kevin’s. However, neither the Earley family or anyone else’s should have to go through the lack of support for a brain disease such as bipolar (or schizophrenia) that should have been treated much sooner than it was with consistent, sustained support. The potential risks that individuals endure and that families are helpless to prevent could be reduced or eliminated by compassionate intervention which requires sensible assisted outpatient treatment (AOT) laws in every state. No one should routinely need to go through the revolving doors of short hospital stays, incarcerations, homelessness or victimization when they have a severe mental illness but lack of insight (anosognosia) to seek and remain in treatment. Timely, effective treatment should be a right, not something only provided once an individual reaches the level of danger that many treatment laws require. So, yes, I certainly think that surviving the broken mental health system and outdated treatment laws is something to celebrate and be proud of, and acknowledge that Kevin and others like him should be commended for their remarkable courage and fortitude. I also think that every family who has endured such an experience should do all they can to advocate for changes to our current mental health system so that preventative treatment under effective AOT laws is the standard. Individuals with severe mental illness and their families deserve no less than effective treatment when it is needed. High Five to Kevin. I too have a son of the same age of Kevin who pretty much has the same story to date from onset to recovery. It goes to show you with love, support and a caring community our MI loved ones want just what we do, a warm place to sleep, to be loved and a purpose. And Kevin and Pete did it and so will we, our son is on the same path as Kevin and his story penned here could of been my beatiful son writing it as well. Pete is our hero, not just Kevins, what he has done for MI and not just for the consumer but for the caregivers as well. Love your loved ones, they deserve it, its a win win for all. I also live with MI and Thank you for sharing your success story & bringing HOPE to ME and others! Hi Pete: I read the story and tears just happened. Give that young man a hug from me. The battle he fights is the toughest ever. “Mike” you are my hero. I cannot imagine what you have overcome to this point. Stay well and happy. May God Bless you always. Your Dad is one terrific guy for the expose he wrote in order to bring to light our broken MH system to many. He did this with one very special person in mind and that was you. I am very proud of you as well.